Preheat the oven to 350. 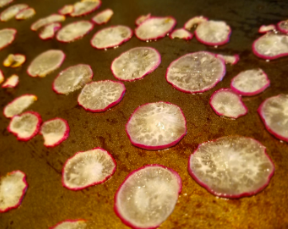 Wash and dry the radishes thoroughly. Remove the stems. Slice them with a mandolin slicer (you can also do this by hand, but the slicer is much quicker and easier). Toss with olive oil and some sea salt. Spread in a single layer on a baking sheet and sprinkle with a bit more sea salt. Bake for 12-15 minutes, until just slightly browned. Let cool and serve immediately.